The health and social care sector provides over 17,300 jobs in Conwy CB and Denbighshire. Overall, this is one in five jobs in the area (one in four for Denbighshire, which contains a major hospital, Ysbyty Glan Clwyd) and is by far the biggest employment sector in the area. 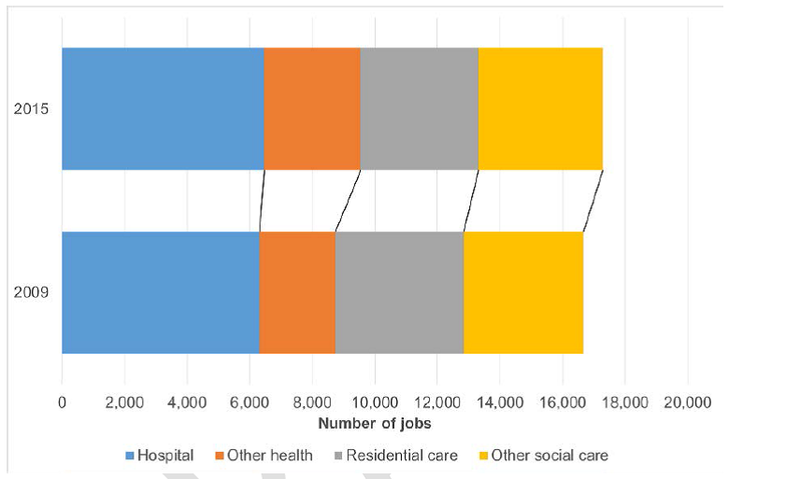 Within that total, 6,450 jobs are in hospitals, 3,100 are in other health care sectors, 3,750 are in residential care activities, and 3,950 are in the non-residential social care sector. Changes within the sector are being driven by demographic change (increased demand for care), social and political factors (including the push for resource efficiency), technology and innovation (advances in treatments and opportunities for patients manage their own health), and growing patient and service user expectations. These drivers are generating skills and performance challenges in all of the key health and social care occupations, as the sector responds to changing demands. North Wales is experiencing on-going and significant recruitment difficulties for both GPs and nurses. These problems are exacerbated by the rural nature of the area, but are also evident in the urban coastal towns with recent examples of hard to fill vacancies in North Denbighshire. This has been identified as a significant short and long term risk to the provision of primary care services. Recruitment problems become even more worrying when you consider the age profile of the current workforce. Data collected in May 2016 shows that 19% of the GPs in North Wales and 17% in Conwy and Denbighshire (BCUHB Central area) are over the age of 55. The potential for these GPs to retire early has increased following changes to pension legislation, which benefits highly paid individuals to take early retirement. Since 2009 employment in health and social care in Conwy CB and Denbighshire has increased by about 600 jobs, primarily in the ‘other health’ sector. However employment in residential care fell by about 350 jobs in the period. The fall in residential care employment is of particular concern. Between 2012 and 2015 North Wales had a net loss of nearly 400 nursing home placements (taking account of some new homes built, but a large number closing down). Research has shown that around 94% of the residential care homes in the area are independent in the private sector and the majority of these homes are operated as independent single businesses with only a small number operating as a group of homes. This makes them more vulnerable to changing market conditions. In many cases they closed because they found it too difficult to recruit nurses or found it financially unsustainable to offer nursing care for the fees paid by statutory commissioners. Over the next five to ten years, the sector faces rising demand and reduced availability of resources, as well as structural reform. Such changes are likely to lead to a more diverse set of employers operating in the sector and a more joined up approach to service delivery by health and social care staff. Existing occupations are likely to expand beyond their current parameters, and new roles are likely to emerge which fill gaps between the traditional health and social care professions. The potential for economic growth in this sector cannot be understated. The number of places for training for GPs, nurses and allied health professionals is not sufficient to meet the requirements across the whole of the UK, as well as North Wales. The Welsh GP trainee system which sources trainees from Cardiff Medical School struggles to meet the workforce demands of the North Wales Primary Care workforce economy. Good relationships exist with the North West, both in Liverpool and Manchester Medical Schools, which could be developed further. The development of the emergent medical school in Chester may also prove beneficial. In addition to current recruitment and retention initiatives for GPs, the Welsh Government has recently announced the introduction of financial incentives for GP trainees, which include financial support for certain assessment costs and a bursary scheme for trainees who agree to remain in the area during training and for a year of practice thereafter. The number of people aged 65 and over who receive residential based services is expected to almost double by 2035 as shown below. This is a result of both the ageing population and the increasing number of people with complex care needs such as dementia. The number receiving standard residential care services is expected to decrease or stay the same, but the number requiring specialist nursing care is expected to show significant increase. The Housing Learning and Information Network has developed a tool to support commissioners and planners to anticipate demand for different types of accommodation with support. 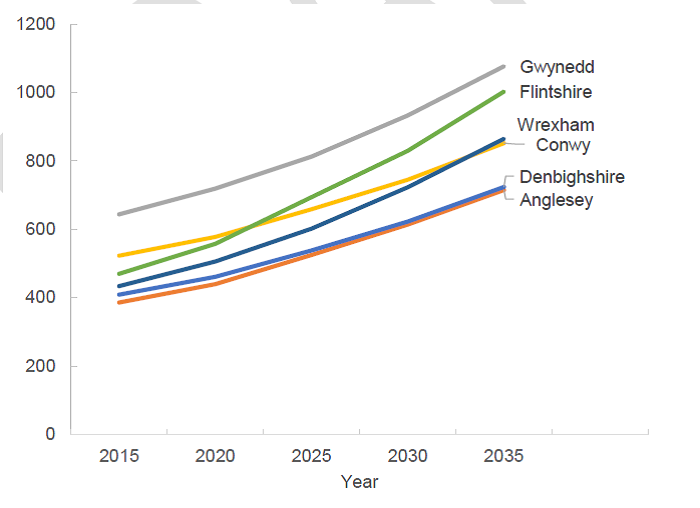 The SHOP@ tool predicts that by 2030, there will be an over supply in Denbighshire of residential care places and under supply of nursing home, sheltered housing and housing with care across the area. This suggests there is potential for future employment growth in this sector. People wish to see an integrated health and social care services that include a focus on prevention and realising the potential for new technology; and where services are delivered within localities and independence is supported. People told us they had concerns about access to social care and health services and saw integration as key to resolving this.